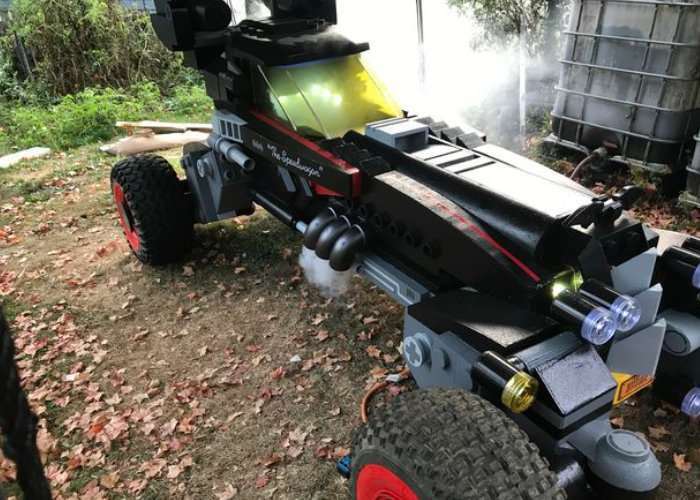 Batman and LEGO fans around the world are sure to enjoy this awesome life-size LEGO Batmobile, inspired by the LEGO Batman Movie. Check out the video below to learn more about the construction and design of the awesome vehicle. If you fancy building your very own LEGO Batmobile jump over to the Instructables website via the link below where its creator Haunted Spider has kindly published step-by-step instructions. Instructables user Haunted Spider explains more about the inspiration behind the build and some of the techniques used to create it. Below is the final results of my build with as many details as I remembered to photograph, and it is very picture heavy. The build will be used this year for Halloween. First at East Harbor State Park for the Family Friendly Halloween campout which was on September 28 – October 1, and then be transported back to my yard for the rest of October. Following Halloween, I have to find a place to store this beast of a build. It ended up 12 feet long, 6 feet wide, and 6 feet tall at the tip of the wings. I have to say thanks to my wife for putting up with me during the build. She took care of our two little ones while I was working many hours in evenings and on weekends. She is the best and I couldn’t build without her. I am entering this into the Halloween contest so if you find it fun, please vote for me. If you find something else fun, vote for that. Great competition is what makes a contest awesome.